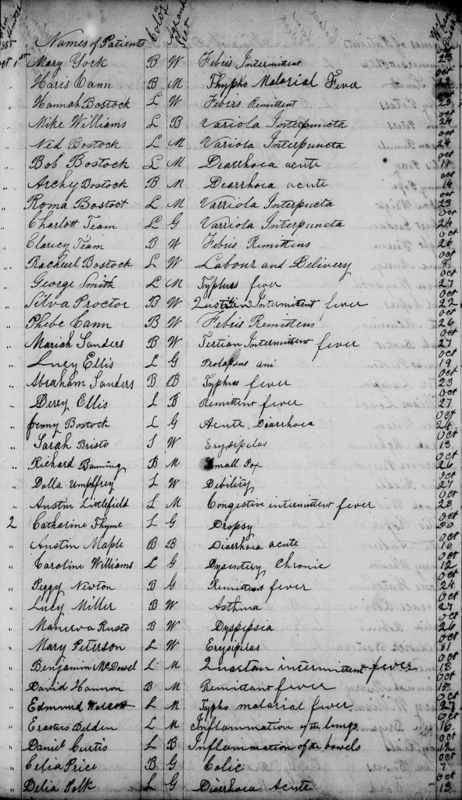 Within Roll 84 of South Carolina Freedmen’s Bureau records is a register of patients at the hospital at Hilton Head, SC. The register records the date of treatment, name of patient and ailment. Although there are column headings for race, age and gender, the information recorded under those column headings does not seem to correspond to the column heading (for instance, under race some entries contain the letter “L” and under age and gender, some entries are “W,” and “B”). Only the sample image is transcribed here. The register, which is 208 pages in length, lists the names of many more patients. You can view the entire document on FamilySearch here.
" Mike Williams L B Variola Interpuncta Oct 24th "
" Ned Bostock L M Variola Interpuncta Oct 24th "
" Bob Bostock L M Diarrhoea acute Oct 11th "
" Archy Bostock B M Diarrhoea acute Oct 14th "
" Roma Bostock L M Variola Interpuncta Oct 23d "
" Charlott Team L G Variola Interpuncta Oct 24th "
" Clancy Team B W Febris Remittus Oct 26th "
" Rachel Bostock L W Labour and Delivery Oct 8th "
" George Smith L M Typhus fever Oct 27th "
" Phebe Cann B W Febris Remittus Oct 26th "
" Mariah Sanders B W Tertian Intermittent fever Oct 27th "
" Abraham Sanders B B Typhus fever Oct 23d "
" Derey Ellis L B Remittent fever Oct 27th "
" Jenny Bostock L G Acute Diarrhoea Oct 24th "
2d Catharine Thyme L G Dropsy Oct 20th "
" Austin Maple B B Diarrhoea acute Oct 10th "
" Caroline Williams L G Dysentery Chronic Oct 12th "
" Peggy Newton B G Remittent fever Oct 24th "
" Lucy Miller B W Asthma Oct 27th "
" Mary Peterson L W Erysipelas Oct 11th "
" Benjamin McDowel L M Quotidan intermittent fever Oct 13th "
" David Hannon B M Remittant fever Oct 15th "
" Daniel Curtis L B Inflammation of the bowels Oct 12th "
" Celia Price B G Colic Oct 7th "
" Delia Polk L G Diarrhoea Acute Oct 13th "
" Bob Smith B B Quotidan Intermittent fever "
" Philis Perry B W Tertian Intermittent fever "
" Fanny Pope L G Remittent fever "
" Gibbon Wright B M Quotidan Intermittent fever "
" Robert Gardner B B Tertian Intermittent fever "
" Bright Warren L B Dropsy "
" Dave Murry L M Quotidan Intermittent fever "
3d Eben Haywood L M Typho malarial fever "
" Paul Capers B M Typhoid fever "
" Ruth Manning L W Tertian Intermittent fever "
" Leah Bucker B G Remittent fever "
" Agnes Preston L W Quotidan Intermittent fever "
" Peter Sampson B B Cholera morbus "
" William Loach B M Constipation "
" Ruben Wilson B B Cholic "
" Enoch Wade B M Quotidan Intermittent fever "
" Willis Roper L M Tertian Intermittent fever "
" Seth Andrews L M Remittent fever "
" Jenny Wheaton L W Quotidan Intermittent fever "
" Moses Hutchinson B M Typho malarial fever "
" Horace Robins L B Dysentery Chronic "
" Julia Robins L G Remittent fever "
" Dederick Bostock L B Quotidan Intermittent fever "
" Vance Bucket B B Dysentery acute "
" Diamond Murry L W Remittent fever "
" Mary Williams L W Congestive intermittent fever "
" Pendar Powers B G Diarrhoea acute "
" Betty Ford L G Remittent fever "
 “South Carolina, Freedmen’s Bureau Field Office Records, 1865-1872,” images, FamilySearch (https://familysearch.org/pal:/MM9.3.1/TH-1942-36672-6558-3?cc=2127881&wc=MFH2-C3D:1017927401,1017932701 : accessed 22 Nov 2014), Hilton Head > Roll 84, Registers of patients at the hospital, vol 1-2, Oct 1865-Apr 1868 > image 5 of 208; citing NARA microfilm publication M1910, National Archives and Records Administration, Washington, D.C.